Now that the holiday season is over, all of our focus is on the upcoming summer season ... but halt -- we are still in the middle of Winter! So if you are getting tired of the cold and misery of the current weather ... think about getting away for a week ! Maybe Mexico, Ecuador or Chile !!? There are some great rides waiting for you with warm sunny days and perfect riding conditions. Prefer to save your holidays for the summer ... make sure not to book too late .. several trips are already starting to be full. But I am sure we can still find the perfect riding holiday for you - just give us a call, send an e-mail or use our online Chat - one of our staff members will be happy to guide you to the right trip. As always we strive to offer the widest selection of trips all over the world at the most competive rates. We continuously work on making the search for your perfect trip as easy as possible and improve the reservation process for you. For 2012 we have many new trips available, which you can view on our "NEW TRIPS for 2012" page, or if you are looking for the best deal - we created a specail "BEST DEALS" page for you. As you know we collect trip reports from our clients, so you can have a look at the best rides on the "Best Top Trips" page. Last, but not Least .. do not forget to check out our page with all the upcoming "Special Offers". For all of you that are on Facebook - an easy way to follow us with new Specail Offers, new Slide Shows or Videos ... become a fan of our "Facebook Page" - we already have over to 12.000 followers! 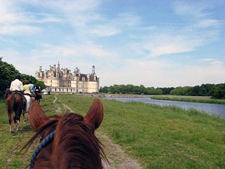 Exceptional horseback riding tours to discover the great wines of Bordeaux, the world’s most famous vineyards. You will ride through prestigious wine country. These are Médoc, Côtes de Blaye, Côtes de Bourg, Fronsac, Lalande de Pomerol, St Emilion, l’Entre deux mers, Premières Côtes de Bordeaux, Graves and Sauternes. The Loire is the longest river in France and its banks are lined with beautiful forestland and handsome vineyards. Immersed in the landscape of beauty and nobility, the more you will come to understand why French aristocracy once flourished here and built their magnificent castles. This charming French Castle sits secluded in the bucolic countryside of Auvergne - aside the lush green forest of Tronçais. 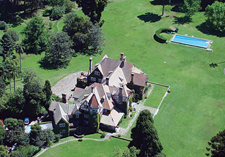 It is a most dignified mansion whose history dates back to 1836, when it was built by the Count Eugène de la Roche amidst the endless acres of parkland and beside the old ruins of the original, ancient castle, known as Château du Mont. The horse riding adventure "Bandalero Trail" is based on the biography of the famous "Bandalero" Joan Sala Serrallonga, the Catalonian Robin Hood. In north-east Spain, the bandit Serrallonga wandered around the mountains of Guilleries and Garrotxa during the 17th century. A Special trail from the Pyrenees to the Mediterranean Sea with daily opportunities to swim in fresh water lakes, rivers and finally in the salt water sea. 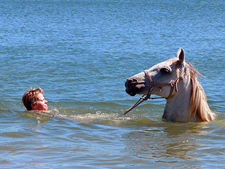 On one day we can even swim with our horses. For a great many reasons, the Route of Santiago de Compostela is a special case within the context of Spanish heritage. It is an historic road which is partially comprised of ancient routes used in previous periods (mostly pre-Roman and Roman) and which has remained in use for over 1200 years, naturally with periods of splendour and decadence. 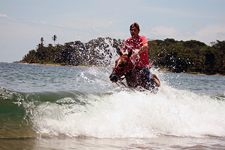 This is a unique adventure trail along the Caribbean Coast all the way to where you can see Panama. It is a trip designed for people that are looking for a bit of an adventure and are interest in the "other side" of Costa Rica and its alternative lifestyle "off the grid". Beaches, Jungle, Wildlife, some of the best seafood and most delicious organic meals in the country await you. Costa Rica. Looking to go somewhere with a group of friends ? Now is the time to secure your best space for 2012! Special Group Offers are online.